All Saints Cargo Biker Leather Jacket: With this mild October weather we're having in the UK a leather jacket is a man's best friend. It's a great addition to any look, especially if you need a bit of an edge for a preppy outfit. 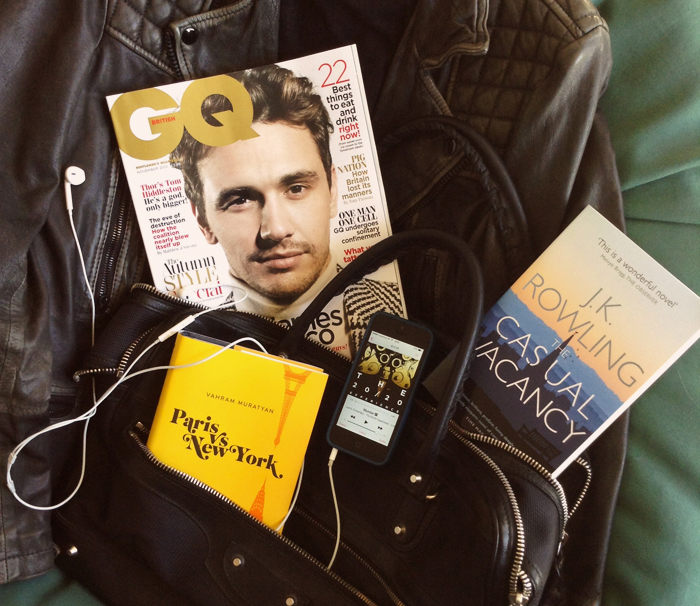 British GQ, November 2013: The latest issue of the magazine is the best companion for a weekend coffee. Also essential to get cracking with all your purchases for the FW13 season. The Casual Vacancy by J.K. Rowling: I usually read a lot over the summer but I haven't had the time to do so this year so I am catching up now. To start, J.K. Rowling's light but brilliantly written latest novel. Don't let the roars of the name put you off. The 20/20 Experience Part 2/2: It only came out last Monday but I have probably listened to it a hundred times. It's got some brilliant upbeat tunes perfect for the weekend or to start the week in high spirits. Paris vs. New York by Vahram Muratyan: Always a favourite of mine. I love flicking through it to enjoy the witty illustrations and the excellent art direction. Balenciaga Overnight Bag: Still my favourite bag since I bought it two years ago. It goes with me to work, on my weekend trips and holidays and, well, just about anywhere else.